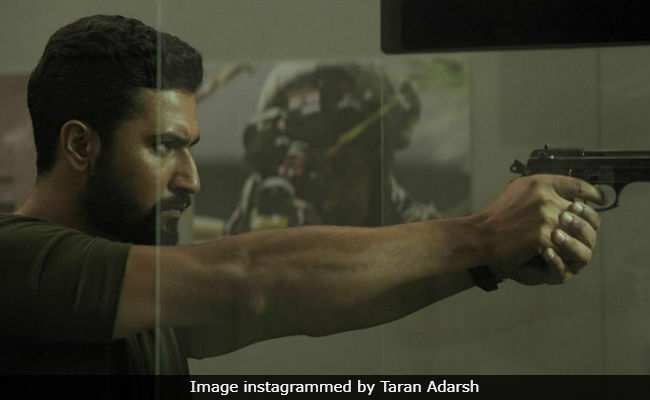 Uri: The Surgical Strike, starring Vicky Kaushal, emerged a "big favourite at the ticket window" by closing the first week at Rs 70.94 crore, reports trade analyst Taran Adarsh. "Uri: The Surgical Strike emerges a big favourite at the ticket window... Crosses Rs 70 crore... First superhit of 2019," he tweeted along with the day-wise break-up of the film's collection. In a previous tweet, Taran Adarsh also said: "Uri is firing on all cylinders at the box office. (It) did not enjoy the perks of a holiday release yet (it) put up a fantastic total in week 1." Uri: The Surgical Strike is directed by Aditya Dhar and it also stars Yami Gautam, Paresh Rawal, Mohit Raina and Kriti Kulhari. Taran Adarsh compared Uri's first week performance to the success stories of 2018 films like Sonu Ke Titu Ki Sweety, Raazi, Stree and Badhaai Ho. Uri, produced by Ronnie Screwvala, is reportedly made on a budget of Rs 42 crore. Speaking about the film's profit, Taran Adarsh said: "Uri is already into profits from India theatrical business. Non-theatrical revenue (satellite and digital rights, and music) will only add to the (big) gains for the makers. This one's a money-spinner." Meanwhile, The Accidental Prime Minister, which released alongside Uri, collected Rs 17.50 crore in the opening week, reported Box Office India. The Accidental Prime Minister is based on Sanjaya Baru's book by the same name and it features Anupam Kher in the lead role. Another Box Office India report stated that this week's Why Cheat India, starring Emraan Hashmi, started on a "very dull note." This means, Uri may have a good run at the ticket window in the upcoming days.